You can debug the scripts on remote servers. 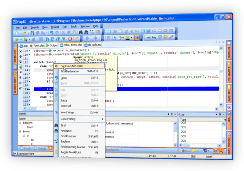 PhpED's dbg - PHP Debugger is the only debugger using binary interface with IDE protected with Secure Socket Layer (SSL) encryption. Of course NuSphere's dbg debugger is used by many competing IDEs but this Secure Socket Layer Protocol is only available in PhpED Professional. When debugging the scripts on remote servers (yes, you can do it with PhpED!) you don't have to worry about your debugger sending the passwords and usernames stored in PHP variables and objects in clear text over public internet! You can even "jump" and "skip" or "repeat" any number of lines of PHP code with PhpED's debugger "Set Execution point" feature. PhpED lest you run multiple parallel debugging sessions at once and switch between them - the feature that brings joy to our users and installs the fear in competitions hearts! With PhpED you can detach the process from debugging and run through in a regular mode at any time. 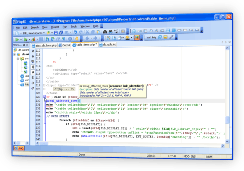 The same powerful NuSphere PHP Editor is available in all PhpED editions. PhpED's Editor provides Code Folding, WordWrap, Splitted view, unmatched flexibility of settings, custom shortcuts and much more. PhpED PHP Editor has Dynamic Syntax Highlighting feature. PhpED will automatically switch the syntax highlighting dependant on the position in the file. PhpED PHP code completion works for nested PHP Classes and method calls and also uses Type Hints to provide hints for dynamically assigned variables. Note: nested PHP Classes calls are displayed towards the end of the movie. Code Folding automatically detects regions with the scopes of PHP Classes, functions, methods, comments and more - and allows you to collapse any random region. PhpED supports 370 international character sets, including 16 versions of UTF, UCS and other Unicode. Instant error checking - fully configurable. PhpED is a true PHP IDE because it gives you tools to develop, debug and deploy your applications. All versions of PhpED come with publishing tools. PhpED provides SFTP - Secure File Transfer Protocol in addition to regular FTP and WebDav. You can upload the entire folder with one click of a button. PhpED's Smart synch feature you don't even need to think about which files are changed - PhpED will figure it out for you and upload or download only modified files. Learn more about the difference PhpED's publishing feature make! Not only PhpED comes with built-in Telnet and SSH terminals, it also lets you seamlessly integrate other tools and execute Shell commands. You can open Shell commands right from the pop-up menu of PhpED Tabs. Not only PhpED has built-in CVS client, but you can also integrate virtually any Source Control system using PhpED's 3-rd party integration. PhpED is probably the only PHP IDE with built-in Telnet and SSH terminals. Learn More about PhpED Unique Integration features! PhpED PHP Profiler displays the information about the performance for each line of PHP code and not just for the whole function or class method. PhpED is the only php development tool on the market that comes with SQL Profiler that will tell you about all SQL queries executed in PHP code and how long do they take and how often are they called. You can preview your PHP and HTML files in Embedded FireFox browser as well as in Embedded Internet Explorer or any external PHP Viewer. 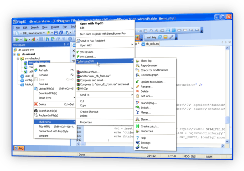 Built in web server and pre-configured local debugger module let you get started right away. When you download and install PhpED you can just start working! No need to install additional servers or extensions. If and when you decide to use to 3-rd party web server, NuSphere's dbg-wizard will also make it simple. It is NuSphere's development philosophy to make things perfect. We never release features that are "half baked". We release features when we know they work. Make sure to take a look at PhpED's latest release. 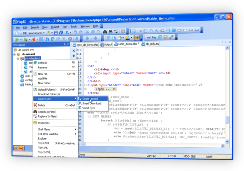 Learn about the full feature set in NuSphere PHP IDE and download the FREE trial today!